Getting married is a huge commitment. People always say this to young people in love, to engaged couples, to newlyweds. People said this to me, and I thought then that I understood what they meant. Yes, I got it on an intellectual level. I even understood it in terms of the commitment one makes in a long-term relationship. But marriage is different. And you can’t begin to understand what it takes to be and stay married until you have had and held another person, for better, for worse, for richer, for poorer, in sickness and in health, every single day of your post-wedding life. For me, that’s been 24 years today. We’ve been through a lot during that time, much good, much not so good. 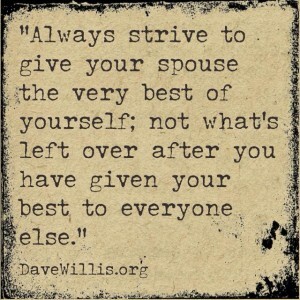 it reminded me that when things are not well in my marriage it is because one or both of us is giving the leftovers to the other instead of the best of ourselves. When you’re young and in love, you think that marriage can survive on love alone. Back then, I never would have believed that even after 24 years, we still would have to work at our marriage every single day. So true Sara. I remember a dear friend of my parents said to me on my wedding day, marriage isn’t 50/50, it’s 100/100. The quote you posted with this blog today reminded me of that. Happy Anniversary! That’s a great quote, that marriage isn’t 50/50, it’s 100/100. I’ve never heard that before. Thanks for sharing.